The Northwest Christian High School boys cross country team entered the state meet as the heavy favorites. The Navigators did not disappoint, winning the program’s fifth consecutive Class 1B/2B state championship at Sun Willows Golf Course in Pasco on November 3 after three of its runners placed among the top 8. 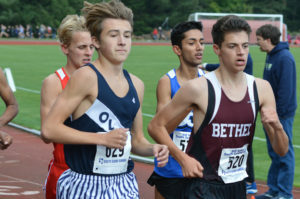 Noah Phillips paced the team with a second-place finish. 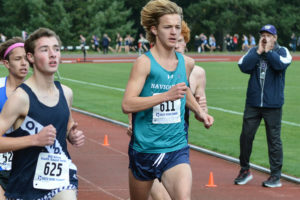 He was followed by fellow juniors Garrett McSheffrey and Cameron Nielsen, who placed fifth and eighth, respectively, for Northwest Christian, whose average team running time of 17 minutes, 26.66 seconds was more than 45 seconds faster than any other squad. 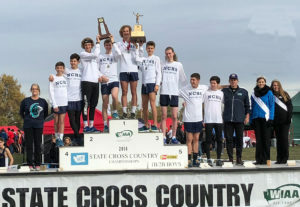 While picking up banners is nothing new for Northwest Christian, Pope John Paul 2 High School posted its best finish in program history by edging Asotin to notch a second-place finish at the state meet. The Navigators finished with 59 points. Pope John Paul 2 was second with 135 and Asotin was third with 148. Adna senior Austen Apperson won his second straight state title, covering the 5K distance in 15:56.40. Phillips was second in a time of 16:21.30, a full 10 seconds ahead of Tekoa-Rosalia’s Gavin Merritt, who finished third. The method worked as Phillips trimmed a full 25 seconds off his state meet time from 2017. Phillips wasn’t the only Navigator to post an improvement as McSheffrey went from 11th overall as a sophomore to fifth with a time of 16:43.90 and Nielsen collected an eighth-place finish (16:56.80) after finishing 31st last year. All three return for their senior seasons next year, making Northwest Christian once again the favorite to clinch title No. 7. 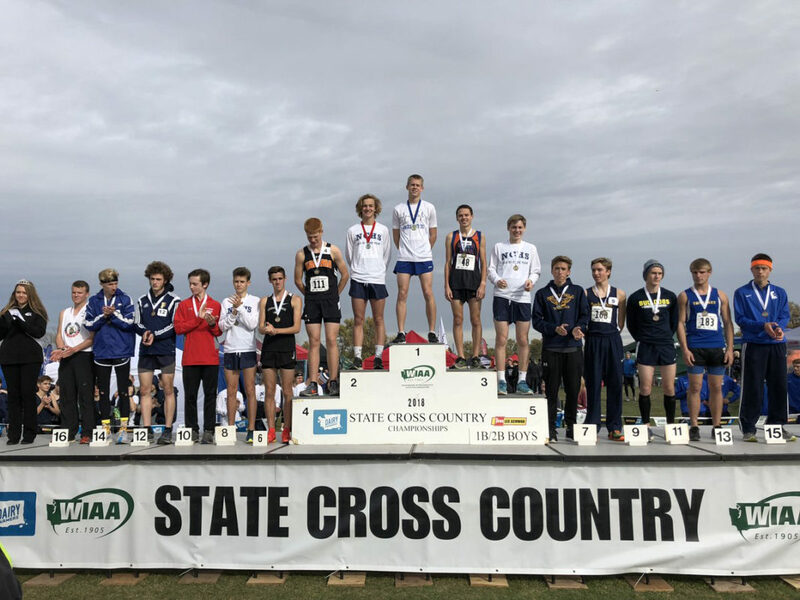 Northwest Christian senior Hamilton Summers closed out his high school cross country as a four-time state champion after finishing 21st overall (17:28). A year after finishing 13th as a team, Pope John Paul 2 showed there’s more than enough cross country talent in Lacey to go around after the Eagles finished second overall as a team. Sophomore Kobe Deutscher led the way for the Pope John Paul 2, finishing seventh in a time of 16:53.50. Senior Caden Deutscher was ninth (16:58.10), while sophomore Mattox Marsh finished 44th (18:01) among the 154 state participants. In the 4A classification, Olympia capped another stellar season by finishing 8th overall as a team. Junior Connor Griffith, who transferred from Kansas last spring, completed his first season with the Bears by finishing 12th overall in a time of 15:53.10. The Bears also received strong performances from junior Max Barnes (16:36.90), freshman Ethan Coleman (16:38.50), senior Tilahun Castro (16:45.90), junior Ben Kosa (16:47.70) and senior Sam Fleckenstein (17:24.20). Yelm sophomore Bryce Cerkowniak was the highest placing local runner in the 3A state boys meet, finishing eighth in 15:55.00, while Black Hills had two top 20 finishers at the 2A meet in senior Pearse Popchock (17th, 16:37.30) and junior Truman Affeldt (20th, 16:39.90). The Rainier girls cross country put the finishing touches on the greatest season in program history by claiming the third-place trophy at the Class 1B/2B state meet. Liberty Bell (56 points) won the overall girls’ title. Asotin (92) was second followed by Rainier (122) and Northwest Christian (137). Rainier senior Elaina Hansen finished fourth (19:50.20) and freshman Selena Niemi finished seventh (20:26.90) to make the Mountaineers one of just two teams to have two placers in the top 7. Liberty Bell was the other school with champion Novie McCabe and sixth-place finisher Icel Sukovaty. Rainier also received a 27th place finish from junior Sophie Beadle (21:21.90). Northwest Christian, which won nine consecutive state titles between 2006 and 2014, posted a top 5 finish for the 14th straight season with junior Tosin Faleke placing 26th (21:20.80).